The world's leading growers and nurseries are heading to our famous Great Pavilion in 2019, but who will be crowned Best in Show? The Great Pavilion has long been the jewel in Chelsea’s crown, and 2019 looks to be no exception. More than 80 exhibitors are lining up to create dazzling displays, with many regular favourites returning to the show, alongside some exciting new faces. For the first time in Chelsea’s history we’ll be featuring a judged Show Garden in the Great Pavilion. Sponsored by IKEA, Gardening Will Save the World is the brainchild of British designer, Tom Dixon. It will be a fully interactive garden, giving you the opportunity to walk through and see for yourself how we can provide sustainable, affordable and forward-thinking solutions to growing food at home and in the community. Tom’s design work was awarded an OBE by the Queen in 2000, with the internationally-acclaimed designer having designs that feature in permanent collections at the world’s most prestigious museums, including the V&A. The National Association of Flower Arrangement Societies is celebrating its 60th birthday in 2019 and will be pulling out all the stops to create a show-stopping display to mark the occasion. The organisation will be looking to recreate its 2018 success, when the team won a Silver-Gilt medal. No stranger to the Chelsea Flower Show, David Austin Roses is celebrating its 50th appearance at the show. The family-owned business was started by David Austin who began breeding plants for a hobby as a teen. He has since gone on to create a collection of roses that are renowned across the world. One particularly memorable bloom from recent years at Chelsea was the Dame Judi Dench rose, named after the acclaimed actress and presented at the show in 2017. If you’re looking for inspiration for your cactus collection, look no further than William’s Cactus. The family-run nursery hails from Yorkshire and specialises in rare cacti and succulent plants. It'll be the first time that the nursery has exhibited at Chelsea and will no doubt be pulling out all the stops for an RHS medal. Be sure to stop by McBean’s exhibit at Chelsea in 2019. With the nursery celebrating its 140th year, the display is sure to be a showstopper. A leader in British orchid cultivation, McBean’s specialises in Cymbidium and Oncidium orchids. 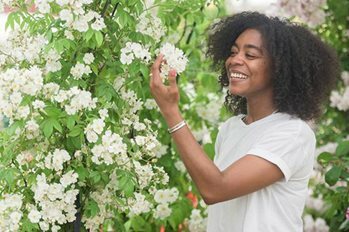 Pose your questions to the experts on the McBean’s stand – having won more than 70 Gold awards at the Chelsea Flower Show, they’re bound to have an answer! Discover how Chelsea came to be the most famous flower show on earth.